1. Alan Rosenfield, managing director at Harmony Asset Management in Scottsdale, Ariz. with $75 million in assets under management. Most of the Street, from Pimco to JPMorgan (JPM) is projecting growth next year in the range of 3.25% and a stock market return between 10% and 15%. The surprise will be looking where most others are not. We have been buying iShares MSCI Mexico (EWW). While most U.S. newspapers carry stories about gangland murders, what is really going on in Mexico is very different. For the past year, Mexican politicians have been showing up our own Congress by actually working together to strengthen their economy. Just recently, both houses approved allowing foreign investment in their oil industry — an industry that has been closed to outsiders for more than 70 years. Mexico is one of the largest producers of oil in the Americas, and adding capital and know-how could improve their output dramatically. Mexico has also started changing banking, education, labor and telecommunication regulations to free up its economy. There is even talk about allowing noncitizens to own real estate. That is a lot in a single year, and don't kid yourself, this is just the beginning of what will be a struggle to reduce the power of many special interests that benefit from the status quo. But such moves will ultimately provide powerful stimulus to the Mexican economy. Mexico now produces products more cheaply than China, and it costs far less to ship from Mexico to the U.S. than from China. In addition, the economic and political friction between China, the U.S. and our allies will provide further interest in having production operations somewhere besides Asia. Finally, if the Street is correct and Europe starts to grow next year and the U.S. increases its growth, Mexico will have added wind at their economic back. 2. Stephen Blumenthal, CEO of CMG Capital Management Group in King of Prussia, Pa., with $500 million in AUM. The ETF with the most upside potential over the next several years is ProShares Ultra Short Yen (YCS). Japan is one of the most heavily indebted developed countries on the planet. Its total debt to gross domestic product is over 500%, compared with the U.S.'s 365%. Japanese gross sovereign debt is around 240% of GDP — numbers that are substantially higher than most of the developed countries. They are borrowing to finance over 50% of their government spending. Japan's public debt breached 1 quadrillion yen this past summer. Japan is at a significant disadvantage with too much debt, not enough revenue, and disproportionately poor demographics to grow the revenue Japan needs to increase growth, increase revenue (taxes) and do it in the face of an aging population. Not only does an elderly population consume less, they earn less and thus pay less tax. Japan's population is shrinking. The reality is that Japan is completely insolvent. The U.S., E.U., U.K. and China are all in some form of debt-related crisis and are all printing at the same time. It is doubtful that South Korea and Singapore sit idle and say "sure, take our sales." They too will devalue to maintain global positioning. We are in a global currency war, and such wars have a history of lasting a long time. The common problem is unmanageable debt. There will be points of crisis, and I believe Japan is next to step on stage. The Japanese yen sits in the least competitive position globally, especially in comparison to the U.S. dollar. 3. Gary Gordon, president of Pacific Park Financial in Ladera Ranch, Calif., with $115 million AUM. The S&P 500 will rise from current levels to top 2100 at some point in 2014, though it will finish closer to 1975. It will be a much rockier ride than 2012 or 2013 due to the heavy spotlight on how much and when the U.S. Federal Reserve shifts its rate policies. Rate sensitivity will create greater volatility than investors currently think. The primary catalyst that will drive the market higher, though, is an extremely measured, very slow Fed exit from QE, meaning that they will be relatively successful at keeping a lid on interest rates in 2014. As long as the 10-year Treasury note does not rise beyond the 3.25% level, investors will continue to put more money to work in stock assets. Due to valuation concerns, however, I give the nod to a foreign ETF that will benefit both from the Fed's measured exit and the European Central Bank's increased stimulus. WisdomTree Hedged German Equity (DXGE) offers exposure to some of the best German brands (e.g., Daimler (DDAIF), Siemens (SI), Bayer (BAYRY), etc). Germany is the best in regional breed. A price-to-sales ratio of 0.6 is a huge bargain relative to what's out there. And investors do not have to worry about fluctuations in the value of the euro. But U.S. is slowly tapering quantitative easing. Europe, on the other hand, is still cutting and stimulating. The dollar will strengthen against the euro, helping DXGE. Declines in the euro's value increase exports. Investors will play the global central bank policy game as long as the Fed doesn't tighten too fast. 4. Daniel Beckerman, president of Beckerman Institutional in Oakhurst, N.J., with $45 Million in AUM. Emerging market stocks have lagged other asset classes so far this year. The year-to-date return for the iShares MSCI Emerging Markets (EEM) is -5%. In contrast, the S&P 500 soared over 31%. However, I view emerging market stocks as a classic contrarian/value play. They are out of favor and they are cheap. Emerging market stocks trade at a price-to-earnings ratio of about 12. This places them at about a 25% discount to U.S. stocks. Although much has been said about their recent underperformance, emerging market stocks have enjoyed superior returns to U.S. stocks in eight out of the last 10 full calendar years. Furthermore, although there have been concerns about a slowdown in China and India, the growth rate of the emerging markets, overall, trumps that of the developed world. It is also the developed world that now has the largest debt imbalances, whereas the emerging markets are in better shape. My ETF pick for 2014 would be WisdomTree Emerging Markets Small-Cap Dividend (DGS). Because it invests in smaller companies, you have more direct exposure to companies that are selling products and services directly to the emerging markets consumer. The larger companies tend to do more business in the U.S., Europe and Japan. The P/E ratio for DGS is about 12. Therefore, it is not trading at a premium to emerging market stocks generally. And small companies tend to outperform larger ones in the long run. Also, because the ETF overweights dividend-paying securities, you end up with more exposure to shareholder-friendly companies. In terms of performance, DGS has beat out its general emerging market counterpart ETFs such as EEM over the past five years and since it was launched in 2007. The risks in this space are that emerging markets behave with more volatility than the U.S., so they can be subject to more downside in a sell-off. Also, it is possible for the relative outperformance in developed-market stocks to continue in the near term. However, this probability is more than priced in. I expect to see relative underperformance in both U.S. stocks and bonds compared to the emerging market world. 5. John Forlines, chairman of JAForlines Global in Locust Valley, N.Y., with $411 million in AUM. While U.S. bank stocks have largely recovered from the Great Recession, European banks remain priced for depression. As a result, we favor owning European financial stocks through iShares MSCI Europe Financials (EUFN), which owns European banks, insurers and diversified financial firms. Pro-austerity governments have been defeated in many countries, and even Germany will likely ease its stance on the issue with German Chancellor Angela Merkel's center-right CDU/CSU party (Christian Democratic Union of Germany and the Christian Social Union of Bavaria) forming a "grand coalition" with the center-left SPD party (Social Democratic Party) following this year's elections. The easing of austerity measures across the continent has been ongoing, but its positive effects have just begun to be realized. Eurozone GDP growth has turned positive and many leading indicators suggest that a further strengthening of economic conditions is in order. With sovereign bond yields in crisis countries having fallen significantly, we expect a further easing of austerity measures, which should continue to stimulate growth. We expect the European Central Bank to act much more aggressively if signs of a new crisis emerge. The days of wooden insistence by the ECB that crisis countries save their banking systems on their own have passed. Even absent renewed crisis, we expect additional accommodation to be provided by the ECB next year. Disinflation has been the dominant force in the eurozone since late 2011 and some countries have entered or are on the edge of outright deflation. There are three policy measures that the ECB can employ to help generate inflation, which is badly needed to help bring down debt burdens in many countries. First, a third round of the ECB's long-term refinancing operations would help buffer banks' balance sheets and enable them to increase lending. Second, the ECB could employ negative interest rates on deposits held at the ECB to encourage banks to make loans rather than hoard cash. Third, the ECB could follow the lead of the other major central banks and pursue a policy of asset purchases. The latter two policies would be controversial, but we believe the ECB would implement them if necessary to prevent deflation. If we are right in our assumptions, then European bank stocks are undervalued and 2014 may see their valuations driven much higher. For 2014, we are looking at WisdomTree Europe Hedged Equity (HEDJ). Europe has started a tentative recovery, and we look for momentum to accelerate next year. After coming out of recession earlier this year, PMI numbers show expansion in Eurozone manufacturing and confidence is firming. The recovery is not exactly even, with Germany leading and France slipping in many categories. Still, European Cental Bank President Mario Draghi is keenly aware of the fragility, and has committed that the ECB will step in as necessary. A significantly lower-than-expected inflation number in October has sparked comparisons to Japan in the 1990s. Draghi swiftly cut the main refinancing rate to 0.25% in response, and we think the ECB will do much more in an effort to avoid a deflationary cycle. Politically, there have been several positive developments that should support the recovery into 2014. Angela Merkel was able to prevail for a 3rd term and negotiate a coalition government in Germany. Progress has been made regarding a banking union, which will certainly help confidence going forward. The ECB has already been named supervisor to the region's largest banks, and will begin financial reviews next year. Further, finance ministers are very close to an agreement on an agency and fund to support troubled banks in the future. Lastly, the main reason why we like HEDJ vs. another Europe ETF is that the euro effects are hedged. We think the euro may depreciate in 2014, so U.S. investors would want to hedge the currency effects. With the ECB's commitment to more stimulus, and the uneven recovery among countries; we think that more will be done regarding monetary policy next year which should pressure the euro. Also, with the Fed beginning to taper, we expect the dollar to appreciate against the euro. So by hedging the euro, positive returns in Europe should be augmented. 7. A. Gary Shilling, president of A. Gary Shilling & Co. in Springfield, N.J.
My recommendation for 2014 is currency-hedged Japanese equities as tracked by WisdomTree Japan Hedged Equity (DXJ). Unlike his predecessors in recent years, Prime Minister Abe retains enough voter backing to override the powerful but cautious government bureaucracy to implement his three arrows. He hopes that massive central bank purchases of government securities, substantial government spending and structural reform will propel the economy out of its two-decade-long deflationary depression. The first two are easy to implement since Abe installed his backers as the Bank of Japan's leaders, and fiscal stimuli already have been emphasized for two decades. Structural reform is tough since Japan was ruled by military feudalism until the 1850s, when the U.S. forced her to open to the West. That led to forced industrialization and the facade of Westernization, but feudalistic attitudes remain. Japan's low fertility rate and zero-immigration policy are already causing population and workforce declines. Women are an obvious source of new employees, but they didn't work outside the home during feudalism and Japan's female labor participation rate is among the lowest of developed countries. Japan's lifetime employment system follows from feudalism, in which people are tied for their natural lives to their liege lords. Lifetime employment commitments by major businesses in Japan, of course, deter hiring except for temporaries and, therefore, impede efficiency. Corporate takeovers also spur efficiency, but are shunned in Japan, where takeovers in feudalism were military and involved the horrors of war. Land is the economic base in feudalism, and its carry-over makes agricultural land reform in Japan very difficult. This is especially true in rice farming, where small plots are common, producers are heavily subsidized and imports are curtailed. Political divisions in feudalistic domains aren't normally based on proportional population, and that's still the case in Japan. Because the Liberal Democratic Party controlled Japan for most of its postwar history and received much of its support from rural areas, those districts generally have greater representation in the parliament, the Diet, than do urban areas. Some rural districts have only a few thousand people but one representative, while some districts in major cities with hundreds of thousands also have just one representative. As a result of agriculture's tremendous political power, river beds in rural areas are paved while needed airport and highway investments in Tokyo wait. Still, Abe's efforts to stimulate economic growth, eliminate debilitating deflation and trash the yen to benefit exporters should be enough to propel Japanese stocks in 2014. Currency-hedged equities avoid giving back in foreign exchange losses the gains in yen terms. 1. 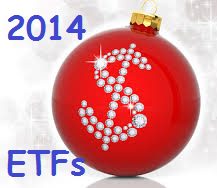 Neena Mishra, director of ETF Research at Zacks Investment Research in Chicago, Ill.
U.S. stocks had an excellent performance during 2013. I expect 2014 to be another good year for stocks, though it will probably not be as spectacular as this year. There is no doubt that quantitative easing has been a major force behind the market's rally this year but the start of tapering signals that the economy is now strong enough to withstand the gradual withdrawal of the Federal Reserve's support. A healing labor market, improving housing market, lower energy prices and still very accommodative monetary policy are expected to further support the market, while the fiscal uncertainty continues to pose some head winds. At current levels stocks are not cheap, but they are not expensive either, specially compared with most other asset classes. Further, corporate earnings will grow as the economy improves further. A gradual rise in interest rates is good for stocks in general, but some sectors will do better than others. Industrials and technology are among the sectors that do well when the economy grows, and on the other hand, rate-sensitive sectors will be hurt. Also, once the QE begins to fade away, investors will turn their focus on fundamentals and only the "better" or "high-quality" stocks will shine. Academic research shows that high-quality companies consistently deliver better risk-adjusted returns than the broader market over the long term. My pick for 2014 is iShares MSCI U.S. Quality Factor (QUAL). QUAL identifies high-quality stocks on the basis of three main fundamental variables: high return on equity, stable year-over-year earnings growth and low financial leverage. Apple (AAPL), Google (GOOG) and Johnson & Johnson (JNJ) are the top three holdings of the fund, while technology takes about 40% of the asset base. I like the ETF's focus on larger, stable, cash-rich companies in industries that typically perform well in the higher-growth environment. With the economic growth picking up in the eurozone, Japan and China, large-cap companies that derive almost half of their revenue from the outside of the U.S., may perform well. They also look attractive compared with the small-cap companies on a valuation basis. However, they may underperform if investors continue to favor high-beta, domestically focused stocks. 2. Joe Barrato, CEO of Arrow Investment Advisors in Olney, Md., with $621.3 million in AUM. With Fed tapering on the horizon, interest-rate risk will continue to challenge investors to seek alternative sources of income, with the search for yield remaining a driving theme in 2014. Since roughly two-thirds of fixed-income issuance occurs outside the U.S., we believe a global approach to fixed income makes sense for purposes of yield, return opportunities and diversification. We also see improving global growth next year, which may benefit international equities, particularly in developed countries where valuations and fundamentals remain relatively attractive. Concerns over rising interest rates have led some investors to reduce the duration of their fixed-income holdings in an attempt to reduce volatility. One approach is to take duration out of the equation by looking for alternatives to traditional bond investments. With interest rates at or near an all-time low, investors' fears about rising interest rates are justifiable, making a multi-asset approach to yield attractive next year. As such, we continue to talk with investors about Arrow Dow Jones Global Yield (GYLD), which offers a competitive yield (30-day SEC yield of 6.04% and distribution yield of 7.22% as of Dec. 17) along with multiasset exposure to potential growth opportunities on a global scale. In addition to global equity exposure, GYLD provides equal weight exposure to global sovereign debt, global corporate debt, global alternatives such as master limited partnerships (MLPs) and global real estate.